3.1-megapixel shots (it saves them to miniSD cards). Finally when you're done shooting you can hook up the HV20 to your HDTV via its HDMI output. 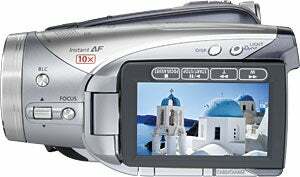 Pricing is expected at around $1,099, though we're a little disappointed Canon chose MiniDV over a HDD.